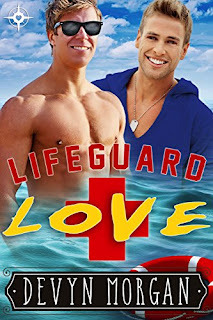 When up-and-coming social media star Kip Weiss lands a summer lifeguard job at an exclusive resort, there are strings attached. The sweet bonus privileges require a roommate, and after a year in the random dorms, Kip wants to pick who shares the tight quarters. He invites his best friend, the only kid at school who didn’t look down on him for being poor. When Thad arrives, he can’t stop looking at his friend’s new beefy physique. But Kip can’t be into guys, that would ruin his hard-built social media brand, wouldn’t it? Thad Rowland needs a break. After an academically stressful year at school, his father lines up a boring internship to fill his summer. His true passion is art, not accounting. When his best friend Kip invites him to apply at the resort he jumps at the chance to get away from it all and wear his lifeguard whistle again. But can he live in such close proximity to his celebrity-gorgeous best friend, and keep his true feelings to himself? Far away from everything else, the hunky college guys are in an oasis of suntan lotion, their own private apartment, and an entire summer stretching before them. Will their new feelings tear them apart as well as ruin their careers and family ties? Or is the summer heat just the beginning of a scorching hot future? After getting a little taste of this story to go with that Thousand Word Thursday story, I wanted to read the rest. Both young men are working on discovering who they are and what they want from life, not just each other. Thad more to work on, between being open about his sexuality and needing to go against his father, who has his life mapped out in a direction Thad doesn’t want to go. His sexuality is almost the smallest problem. He’s been taking his frustrations out in the gym, getting all buff and attractive. Kip’s surprised at the intensity of his attraction to Thad and his new muscles. Kip seems shallow at first, but he’s quite driven, and he’s really there for Thad by the end of the story. For all that this had some important themes going, the treatment is lighthearted, and the challenges met with medium-low angst. The guys are too busy discovering the joys of each other and worrying about how they look on Instagram. Well, they look great. The resort setting is mostly background for social media: we see the guys being buff in swim trunks but not actually rescuing anyone. Seemed like a lost opportunity: they exist in a vacuum at the resort, and only when family gets involved do they interact beyond each other and an internet audience. They do have a lot to explore with each other, given how little experience they have.